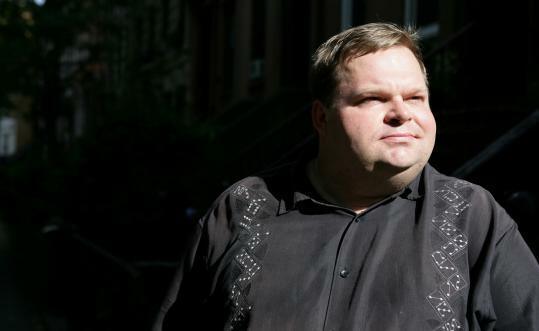 BROOKLYN — On the tech-geek continuum, monologist Mike Daisey knows precisely where he resides. It’s a respectably savvy spot, especially for a theater guy. Daisey, 36, one of the American theater’s very small cadre of prominent storytellers, and a man who bit a number of the hands that fed him with his 2008 monologue “How Theater Failed America,’’ has been an Apple user and fan since his childhood in Fort Kent, Maine, when his first computer was an Apple IIc. The closest thing to a hobby that he has is reading Mac rumor sites. His current fascinations with industrial design and user-interface design grew directly from Apple and the aesthetic of its cofounder and CEO, Steve Jobs. That there was an iPhone in Daisey’s pocket as he explained all this is nearly a given. More surprising is how sharply double-edged his lifelong fascination with Apple has recently become — an evolution evident in the title of his new monologue, “The Agony and the Ecstasy of Steve Jobs.’’ Using the arc of Jobs’s own story, which Daisey called “really a very Greek mythology,’’ the piece combines Daisey’s intense admiration for Apple’s arrogant, elegant, game-changing design with his unmistakable anger at the working and living conditions of the people who manufacture Apple products, as well as products for many other American tech companies, in Shenzhen, China. The fledgling monologue, which Daisey performed for the first time last week at Woolly Mammoth Theatre Company in Washington, D.C., will develop further this summer at Seattle Repertory Theatre and on a five-city tour of India. Early next year, it will settle in at Berkeley Repertory Theatre for a run coinciding with the Macworld expo in San Francisco. But first Daisey is bringing the piece to the Cape Cod Theatre Project in Falmouth for a three-performance run that ends tomorrow. “The Agony and the Ecstasy’’ is just as autobiographical but more journalistic than most of Daisey’s 15 other monologues, among them “The Ugly American,’’ which he performed at the Cape Cod Theatre Project in 2004; “Tongues Will Wag,’’ which he did there in 2007; and “Invincible Summer’’ and “Monopoly!,’’ both of which he did at American Repertory Theater in 2007. Although the idea of creating a piece about Apple had long been gestating, it was something Daisey read on a Mac news site a couple of years ago that led to a moment of clarity. A customer had bought a new iPhone that already had photos on it: random images shot by a tester on the factory floor. For the first time, Daisey started thinking about where his electronics come from. A year ago, the second half of the equation came with reports that a 25-year-old employee at the enormous, 430,000-worker Foxconn factory in Shenzhen had died — possibly a suicide, possibly not — after being interrogated by company security about a missing iPhone prototype. Daisey decided to go to Shenzhen, a city of 14 million people, and do what he thought an investigative journalist ought to do. He expected that American journalists would be thick on the ground to report on a spate of worker suicides that had just occurred at Foxconn. Apparently prompted by living and working conditions, they took place while Daisey was performing at the Sydney Opera House, en route to China. American journalists did not treat the deaths as a big story, and Daisey’s disgust at that is palpable. In Shenzhen, Daisey employed his own set of journalistic ethics. Working with a translator, he went to factory after factory, pretending to be an executive from a fictitious American company interested in buying whatever it was that the factory manufactured. He set up multiple meetings every day, handed out fake business cards made in the business center of his hotel, and got access to workers by explaining that his people in America were nervous about the labor situation. He also stood outside the factory gates to talk to people and made other contacts through labor and activist groups there. Child laborers — 11, 12, 13 years old — were not difficult to find, he said. Like all of Daisey’s shows, “The Agony and the Ecstasy’’ is unscripted. Last week, the day he first performed it, he started making an outline of the show in the morning, worked on it for 10 hours straight, then went onstage. As always, there was no rehearsal to an empty room or to his wife. For Andrew Polk, artistic director of the Cape Cod Theatre Project, working with Daisey is different from working with any of the writers who develop their plays in Falmouth. He got an inkling of that when he first approached Daisey about coming there in 2004. “I said, ‘I need a script.’ He said, ‘There is no script.’ ’’ Instead, Polk got a copy of Daisey’s outline, which was detailed, organized, and quite long. The ability to perform that way is a heightened version of a skill Daisey forged on his high school speech and debate team, when he routinely had 20 minutes to craft a 15-minute extemporaneous speech about foreign policy. In the first half of the season, working with notes was allowed; in the second half, it was not. Onstage, he uses notes — but, he was at pains to say, he does not write the stories he tells. Even “Rough Magic,’’ the anthology of his monologues due out next year, will be composed of transcripts rather than scripts, each cobbled and reconciled from several different performances. Daisey calls the first performance of a monologue “the birthing’’; guiding its development thereafter he likens to raising a child. Early on, he changes the piece constantly. Eventually the outline that Daisey brings onstage is “covered in stickies, and sections are crossed out,’’ with parts cut from one page and retaped elsewhere as he rearranges it. In Falmouth, he estimated, the piece will be 30 to 40 percent different from what the Washington audience heard, and it will change each night. Daisey may be changing as well. Having returned from Shenzhen last month, he says he’s curious about the impact his newfound knowledge will have on his buying habits. The one effect so far concerns Daisey’s phone: It’s his old iPhone 3GS, not a new iPhone 4 — a prototype of which the Foxconn employee who died after being interrogated had misplaced. Knowing that, Daisey said, he could not buy the new one.